Dual Sink Dispenser dispenses two products into a kitchen sink with the turn of a ball valve. ProFill's attractive ergonomic design takes up less wall space yet provides more label space for product identification. Profill is available with Action Gap or Air Gap backflow protection and compression or garden hose connection for ease of installation in any environment. 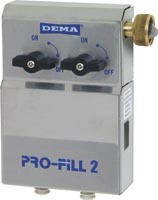 Profill's unique design allows for dual water feeds to control water temperature for detergent and sanitizer separately.